The health risks of fast food are well-documented, and, while eating it occasionally is unlikely to cause problems, the same isn't true for regular consumption. Relying on fast food for several of your weekly meals puts you on the fast track to potential health issues down the road, because most fast food provides few beneficial nutrients and an overabundance of fat, salt, sugar and overall calories. Scientists are still gathering data on the link between health risks and fast food consumption, but they have found eating it regularly ups the risk of various chronic conditions. An area of research has focused on the link between fast food availability and obesity; the running theme is that neighborhoods and areas with a higher density of fast food restaurants tend to have higher obesity rates. Scientists collected statistics on fast food restaurants and obesity in New Orleans, since Southern urban areas of the U.S. have the highest obesity rates in the country. Based on the information gathered, the authors found a link between a higher number of supermarkets in each neighborhood and a lower risk of obesity. In addition, they report a higher number of fast food outlets and convenience stores in each neighborhood increased the risk of obesity. The study was reported in the Journal of Urban Health in September 2010. A large 15-year analysis published in the 2005 edition of the journal Lancet found a strong link between how much fast food people eat and the risk of developing insulin resistance, often referred to as pre-diabetes. Insulin resistance occurs when your body fails to respond appropriately to the blood sugar-lowering hormone insulin. Over time, unabated insulin resistance leads to type 2 diabetes. Researchers followed more than 3,000 young adults ages 18 to 30 -- black and white -- over the course of the study. The authors reported health implications for both ethnic groups. Compared to participants who visited outlets less frequently, eating fast food more than twice a week doubled the risk of insulin resistance, according to the study. 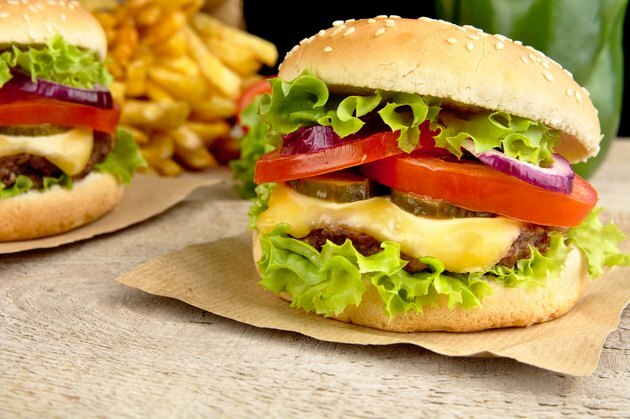 Fast food may also put your heart health at risk and negatively impact your mood, according to statistical studies. Scientists from the University of Las Palmas de Gran Canaria and the University of Granada examined data on 9,000 participants, tracking their diet and lifestyle habits. They found a relationship between fast food and baked good consumption and low mood. Researchers concluded that eating fast food increased the participants' risk for depression. Compared to those who ate little to no fast food and baked goods, regular consumption increased the risk of depression by 51 percent, report the authors. The study was reported in the March 2012 edition of the Public Health Nutrition journal. Americans and other Western countries tend to eat more processed and fast food than Eastern areas, and scientists have found that when Eastern populations eat fast food in a similar pattern to the West, heart disease risk increases. University of Minnesota School of Public Health researchers evaluated the eating habits of Singapore residents. They report that frequently eating Western-style fast food increased the risk of dying of heart disease based on frequency. Eating fast food two to three times per week increased the risk of dying from coronary artery disease 50 percent. The greatest risk was found when subjects ate fast food four or more times weekly; the risk of dying from CAD rises to 80 percent. Even eating fast food just once each week increases heart disease risk; authors report a 20 percent increase comes along with once weekly consumption of fast food. The journal Circulation published the study in July 2012. Make cutting back your first priority if you regularly consume fast food. One of the best ways to do this is to plan your meals ahead of time. This way you're prepared with nutrient-dense foods when hunger strikes. Plan your breakfasts, lunches, dinner and snacks. Make snacks easy to carry by putting them in baggies or small containers. Be ready to satisfy a sweet tooth with snacks such as peanut butter and bananas, apples with cinnamon or yogurt with fresh fruit. One of the primary reasons people eat fast food is for convenience. If you're short on time, make quick and easy meals such as salads, sandwiches using lean meat and whole grain bread, turkey meatballs with whole-wheat pasta and wraps with plenty of fresh vegetables and your choice of meat. Try preparing them the night before so you have a full day's worth of meals for the following day. Does Eating Fast Food Cause High Blood Pressure?